For the console version, see Call of Duty 2: Big Red One. 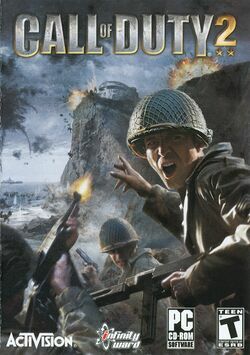 The sequel to the 2003 Game of the Year, Call of Duty 2 redefines the cinematic intensity and chaos of battle as seen through the eyes of ordinary soldiers fighting together in epic World War II conflicts. The winner of over 80 Game of the Year awards, Call of Duty 2 offers more immense, more intense, more realistic battles than ever before, thanks to the stunning visuals of the new COD2 engine. The Pocket PC version of Call of Duty 2 was developed by Aspyr Media. First details and screenshots were announced in August 2006 and the game was released in Spring 2007. Due to its limited appeal, the game is only available through internet download. The multiplayer mode contains four maps and two modes: Deathmatch and Team Deathmatch. Game of the Year Edition. American. Mac Edition. American. Developed by Aspyr, not Infinity Ward. This page was last edited on 4 August 2016, at 22:20.